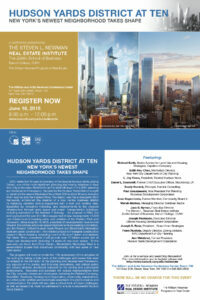 On Thursday, June 18, the Steven L. Newman Real Estate Institute at Baruch College hosted a major conference on Hudson Yards that commemorated the 10th Anniversary of the adoption of the Special Hudson Yards zoning district, one of the most significant planning and zoning initiatives in New York City in decades. The conference, entitled “Hudson Yards District at Ten: New York’s Newest Neighborhood Takes Shape,” was organized with former Executive Director of the New York City Department of City Planning Richard Barth, Capalino+Company’s Senior Advisor for Land Use and Housing Strategies. The district covers over 170 acres on Manhattan’s west side with zoning that provides for more than 30 million square feet of new commercial development, 13,600 new mixed-income housing units, and substantial new open space. Joining City officials, real estate leaders, developers and land use experts in this critical project, Richard moderated and drove the discussion on the first panel, Concept to Implementation. As part of this dialogue, panelists explored the challenges and issues that were considered in the planning and development, key components of the zoning and financing innovations, and critical public and private projects made possible by the zoning. Richard noted that during his career at City Planning, while he had been involved in major initiatives throughout the city, few matched the scope, importance, and long term impact of the Hudson Yards Plan. “It is particularly gratifying to have been involved in a project of this magnitude and to see the vision become a reality as this area is being transformed and woven into the fabric of Manhattan,” said Richard Barth. 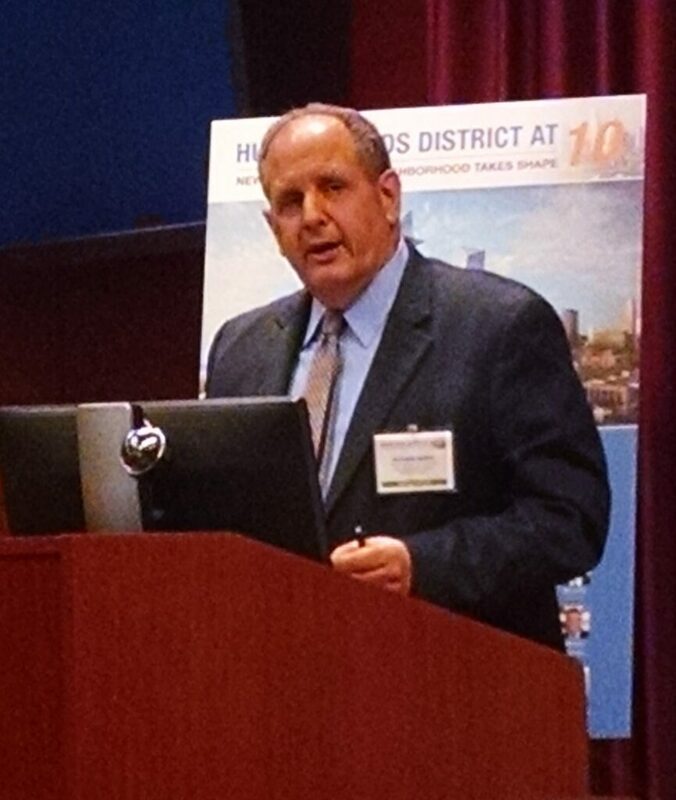 Former Deputy Mayor and former Bloomberg L.P. CEO Daniel L. Doctoroff, the current Chairman and CEO of Sidewalk Labs, was the keynote speaker, touching on the vision of and need for the plan, as well as the key strategies for implementing it. He noted the critical success of the innovative financing for the Number 7 subway line extension, which relies on capitalizing on increased values created by new development. Dan highlighted that it is the responsibility of the public sector to provide the infrastructure investment and regulatory environment to allow the private market to respond. The second portion of the conference focused on projects that had been made possible by the zoning, as well important challenges going forward. Moderated by Edith Hsu-Chen, Manhattan Director of the New York City Department of City Planning, the panel featured a presentation from L. Jay Cross, President of Related Hudson Yards, who showcased their project, which at more than 16 million square feet and 14 acres of open space is the largest construction project in the United States. Alan Chun presented Brookfield’s Manhattan West project which will contain 7 million square feet and is positioned at the gateway to the Hudson Yards district between Ninth and Tenth avenues along the 34th Street corridor. Other panelists include: Bruce Mosler, Chairman of Global Brokerage at Cushman Wakefield;Alan Chun, Senior Vice President with Brookfield Property Partners; Paul Januszewski, Vice President for Planning, Rockrose Development Corp; and Joe Restuccia, Executive Director, Clinton Housing Development Corporation. The panelists had a lively discussion on a range of topics, including the changing office market, the Javits Center, the Farley Building, the balance between commercial and residential development, bus parking, and completion of planned open space. These are some of the challenges to be addressed over the next 10 years as the district is transformed and the area continues to evolve.